Transmitter "Turns On" or "Turns Off" a Lightning Receiver or 2+ Receivers as a group (simultaneously) or 1+ Receivers that you can't see. Range: 60-75 ft. This battery-less Transmitter sends On or Off commands, depending on which button is pushed. The buttons move together, but the Transmitter knows where you put your finger! The Large Plate is about the size of a US Switch Plate and can screw onto a US switch box. Receivers matched to this Transmitter will all be turned "On" and "Off" at the same time. Pushing the lighter circle on the Transmitter button emits an "On" code, pushing the darker circle emits an "Off" code. 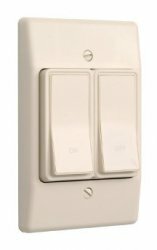 The Large Plate Switch is designed to cover the hole in the wall left after a typical US wired switch has been removed. Transmitter Dimensions: 5.14"L x 3.27"W x 0.54"D (approximately the same size as a standard North American light switch plate). For complete details, click to see the Technical Data Sheets for Lightning Products.